Home / Bible Questions / Creation and Evolution / Is there evidence that the flood was global? The first book of the Bible, the book of Genesis, chapters 6 to 8, tells about a great world-wide flood. Such a major flood would surely leave much evidence. When we look around the world we do indeed find much evidence. Most scientists claim that the past can be understood by what is happening in the world today. The Bible describes a world-wide flood that was so great that it cannot be understood by looking at modern floods. I will list several examples from a study of the earth that a great catastrophe once involved the whole earth. Fast moving water can erode away dirt, sand and even rock. When the water slows down, the dirt, sand and rock are dropped. This sediment may contain minerals that can be weathered away quickly. In the San Francisco area of California, beds of sediments hundreds of feet thick contain minerals that would have been destroyed if not buried quickly. Such beds can be seen in many other areas world-wide. These sediments could not have been laid down slowly over thousands of years otherwise the minerals would have been destroyed by weathering. Such beds tell us that a great quantity of water was involved and the sediment was deposited and buried quickly. Stones that are rolled around by waves or currents become rounded and are called wash rock (also called conglomerate). 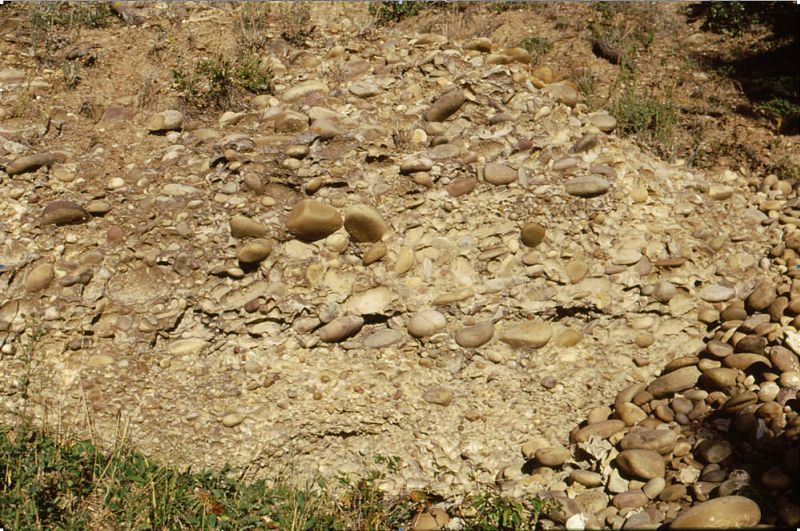 Conglomerate beds are common all over the world. One bed that I have studied in Alberta, Canada contains granite boulders of football size, that have been washed several hundred miles from the Rocky Mountains, the nearest source of this kind of rock (Figure 1). This bed is close to 100 feet thick and extends over several hundred square miles. Similar beds of even greater extent are present east of San Diego, California, along the Columbia River, in Washington and Oregon, on the east flank of the Bighorn Mountains of Wyoming, in the Grand Canyon in Arizona, and along the Bay of Fundy, Nova Scotia, Canada only to mention a few in North America. The northwest flanks of the Swiss Alps consist of mountains of uplifted conglomerate that have been washed off the Alps. In the past great sheets of moving water dumped wash rock into thick layers that extend for hundreds of miles in all directions. No similar deposits of this extent are being produced in the world today. 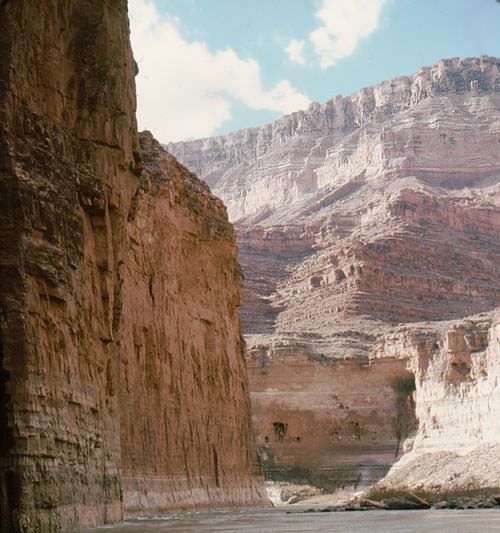 Many beds, such as the Redwall of the Grand Canyon, can be traced for thousands of miles (Figure 2). The Redwall or its equivalent extends north all the way to Canada, east to Niagara Falls in New York, and south to Mammoth Caves in Kentucky. An equivalent is even found on the top of Mt. Everest, the world’s highest mountain. Also evidence of such widespread water is thin bands of clay called tonsteins that appear in or between coal seams. Some of these one or two inch laminations spread across thousands of square miles in Europe. Such massive and far-reaching beds require continent wide, if not world-wide, flooding. The current direction indicators in the Redwall and similar beds, show a generally East to West movement of water. Modern rivers and seas produce currents in various directions depending on the topography of the country. Coal is composed of buried plant material that has been subjected to heat, pressure and chemical action. Some coal beds can be very thick. In the United States and Canada, there are beds that are over 100 ft. thick. Some coal seams in Europe and Australia are several hundred feet thick. Geologists claim that coal is produced from buried marshes and peat bogs. Since it takes several feet of peat to be compressed into one foot of coal, seams of coal several hundred feet thick would require peat bogs over a thousand feet thick. No peat bogs of such depths are found in the modern world. Therefore such thick coal seams require conditions in the past that are not happening in the present world. Some coal seams in the eastern United States can be traced north and south for hundreds of miles. Such geographical extend and such thickness, require massive water movements on a very large scale. A world-wide flood as described in Genesis would be expected to lay down sediments over very broad geographical areas and that is what we see in the geological record. Fish fossils are common. Often the skeletal remains are preserved, that is, the bones have not been scattered (Figure 3). Experiments with fresh dead fish have shown that dead fish in water will disintegrate and their skeletons will fall apart in less than one week. The abundant remains of intact fossil fish skeletons indicate rapid burial sufficiently deep to prevent oxidation, bacterial decay, and breakage due to feeding by other animals. Fish that die in modern lakes or rivers usually completely decay and seldom leave any trace of themselves. One bed containing numerous fossil fish scales extends over several states in the Southwestern United States. Surprisingly very few fish bones are found in the same bed. This seems to indicate that scales sloughed off fish that were starting to decay and were swept away by water and buried well away from where the fish bones were buried. Only broad expanses of moving water could do this. In Brazil fish fossils are found with the skin, muscles, organs etc. all preserved. The fish look like they had just been caught but they are petrified and hard as stone. They are abundant and distributed over several thousand square miles. The large plateau where these fossils are found is well above sea level and a good 500 miles from the Atlantic Ocean. Catastrophic conditions are required to create such an extensive assemblage of animals and plants so exquisitely preserved. Massive graveyards of thousands and even millions of fish, dinosaurs, and mammals are seen in North America, Europe, and Africa. The same is true of plants. From Utah-Colorado north to Alberta-Saskatchewan, Canada, thousands of dinosaurs are found in certain beds such as the Morrison Formation. Dinosaur National Monument in Utah has a visitor’s display where numerous dinosaurs are exposed. Agate Fossil Beds National Monument is a good places to see numerous fossil mammals jumbled together. Other parts of the world also illustrate fossil graveyards. The city of Cincinnati, Ohio sits on top of a great mass of sea animals (Figure 4). 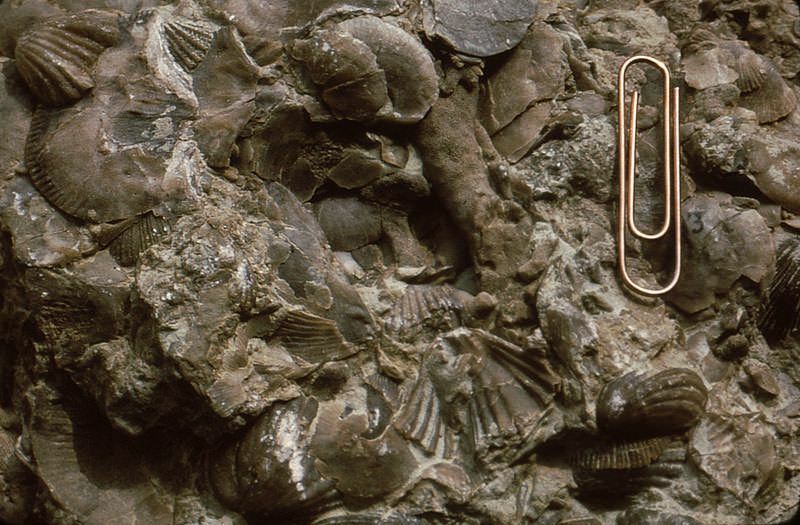 The Messel site near Frankfort, Germany, is also a most unusual collection of animals and plants. These two sites along with others mentioned above reveal the following information: 1. The burial of great quantities of animals together. 2. Rapid burial and excellent preservation. 3. The presence of species now limited to different continents. 4. The position of mammals that suggest death by drowning. Geological processes as seen in the modern world cannot account for such unusual conditions. A world-wide catastrophe involving water is the easiest explanation. A factor that needs further consideration is the mixing of widely diverse animals from different geographical areas and habitats. In Germany the Geiseltel lignite (soft coal) deposit, is a fantastic mixture of a great variety of animals and plants from insects to mammals and birds and from deciduous trees to fungi. The Santana Formation of Brazil mentioned above is a mixture of oceanic animals of various habitats. Open ocean fish, bottom dwelling fish, fresh water fish, and sharks along with plants are all mixed together. 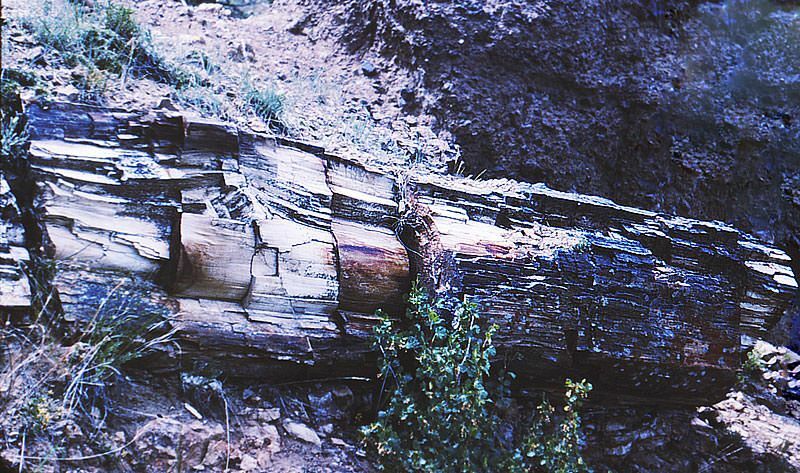 The petrified forests of the Yellowstone area contain trees from a number of different environments (Figure 5). Species range from temperate (pines, redwoods, and willows) to tropical and exotic (figs, laurels, breadfruit, catsura, and cinnamon) and from semi-desert to rain forest types. If the study of fossil pollen from the conglomerate beds that contain the Yellowstone petrified trees are included, more than 200 species have been identified. How could such unusual mixtures be brought together and buried except by unusual catastrophic transport by water? A final example of unexpected fossil mixtures is seen in amber (petrified pitch). It is easy to understand how insects could be caught in sticky pitch and wind could blow pieces of leaves and even flowers into the pitch but how could sea animals such as coral be included? Waves or strong currents from the sea must have broken up and carried bits of coral that stuck to the pitch before it became hard or petrified. These are only a few of many examples from the study of the earth and its contained fossils that support a major world-wide flood. We can trust the Genesis record as a true account of an event in the past that affected the whole world.